Top Notch Material: Win a Safety First Boost-A-Pack for Your Holiday Travel Needs! Win a Safety First Boost-A-Pack for Your Holiday Travel Needs! My big boy is growing so fast that he will soon be out of the booster stage, but for now I am keeping him in one as long as I possibly can. I know it is the safety bet, even though he is 75 pounds now and 48 inches tall! It is crazy how fast my beautiful little seven year old boy has grown! Many people do not realize the need for a booster for him since he is so big, so when he goes places with others, I find that sending him with his own booster is the smartest choice. This can sometimes be a hastle because he is still in a fairly bulky high back booster most days. Having to take the seat belt off the clip and carry the bulky thing to a friends car can be a pain, and do not even get me started on holiday travel!! Trying to transport a car seat or a booster seat on a plane is a borderline nightmare! I have actually asked my mother in law to just purchase a cheap or used booster seat for my son so that he has something when we get there, but we do not have to carry his. I have also rented one from a rental car company. The price for that is simply OUTRAGEOUS!! I think it was something like $15 a day! You can almost rent a car for that price. Thankfully, we no longer have to worry about that! We just received a Safety First Boost-A-Pack for review. This is just soooo cool! Its a booster seat that folds up into a backpack so my son can wear it through the airport and it is small enough to fit into the overhead bin. It is also great to just throw in the car and hand it over to a friend when my son goes places with them. Really, the Boost-A-Pack was a very cleverly thought out product- it had to be invented by a mommy!! 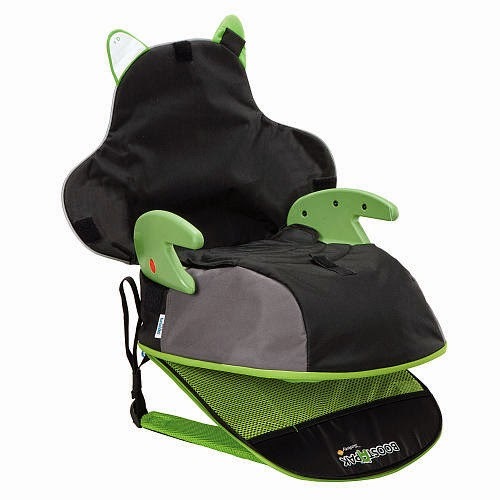 Safety 1st Boost-A-Pack Booster Car Seat is the booster both parents and kids will love. This 2-in-1 sensation is a booster seat that doubles as a backpack. Kids have the convenience of a travel bag and can use it to stay safer when switching from one car pool in the morning to a different one on the way home. The compact size fits easily into an airplane overhead bin making it ideal for family trips too. I am just in love with the Boost-A-Pack and my son says it is very comfortable for him as well! There is even extra room in this backpack to throw in a few toys and necessities for travel. You can purchase one for less than $60 on amazon with free prime shipping so it would make an amazing Christmas gift for the little one that travels frequently! Maybe even as a Christmas gift and a plane ticket for your grandchild to visit you? The S1 Trivecta - McKenna stroller would make my life easier! I like the Whale & Baby Spout Guard. Keeps bath time safe for my niece! I like the Trivecta Stand Alone Stroller! I also like the Glo and Go Monitor. The green Step and Stash Stool would make my life easier.